Using LabVIEW 2014 and LINX 3.0, we created two wirelessly controlled Sumobots; one version using the BeagleBone Black and the other using the Raspberry Pi 2. Ella Rickerson walks through the code and physical design of the LabVIEW SUMO bots. We use two Pmods, the PmodAD2 and the PmodLVLSHFT and all three major components are mounted on the FingerTech ‘Cobra’ Mini-Sumo Chassis. We 3D printed two corresponding controllers that also use the BeagleBone Black, Raspberry Pi 2 as well as the Pmod JSTK2. There are three line sensors on the base of the Sumobot chassis, two in front and one in the back. 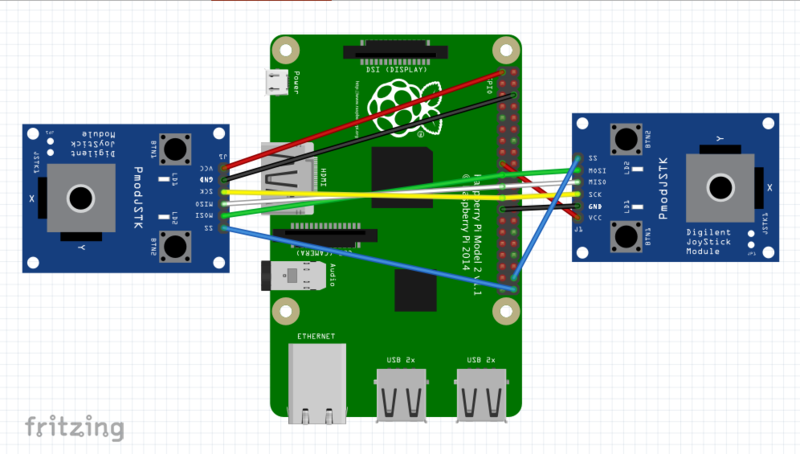 These sensors are supposed to be used in analog mode but because the BeagleBone Black has a limit of 1.8 V and the Raspberry Pi does not support analog input we use the PmodAD2 to convert the analog signals to digital. The Cobra has two on-board PWM motor controllers (we control the speed by adjusting the duty cycle in the code) and direction control inputs. 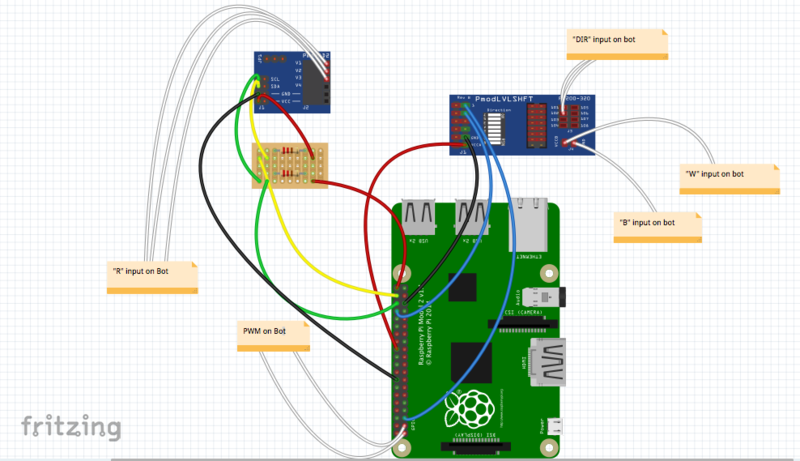 The BeagleBone Black and Raspberry Pi direction controls both run off of 3.3 VDD while the Sumobot only supplies 5 VCC. 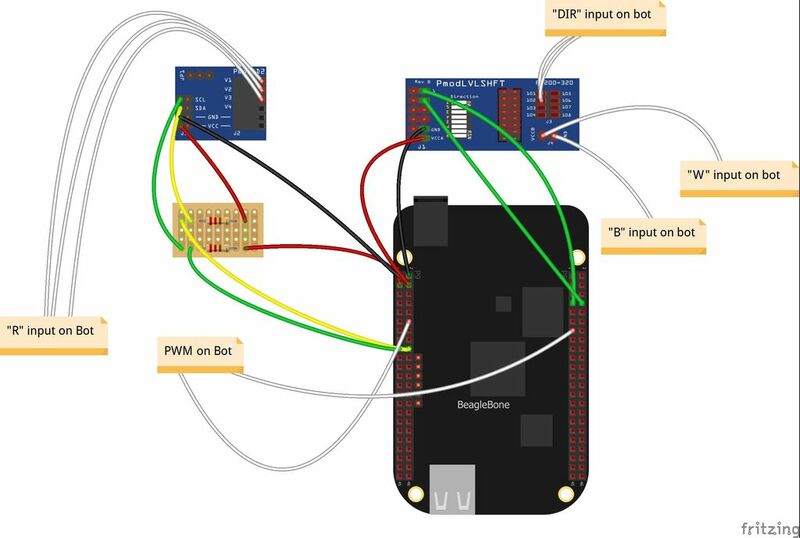 The PmodLVLSHFT allows us to step the 5 V down to 3.3 V.
We use LINX 3.0 to target the BeagleBone Black and Raspberry Pi through LabVIEW. Both the controllers and the Sumobots are connected to WiFi in this demo. The LabVIEW code is wirelessly deployed to each board and the controllers can communicate to their corresponding Sumobot over WiFi using UDP.